When The A.V. Club was at this summer’s Television Critics Association press tour, we sought out Brooklyn Nine-Nine co-star Joe Lo Truglio for a discussion about the show’s fourth season. Specifically, we wanted to talk about the casting of Ken Marino—Lo Truglio’s frequent collaborator and fellow member of The State—as the 99th precinct’s newest captain. 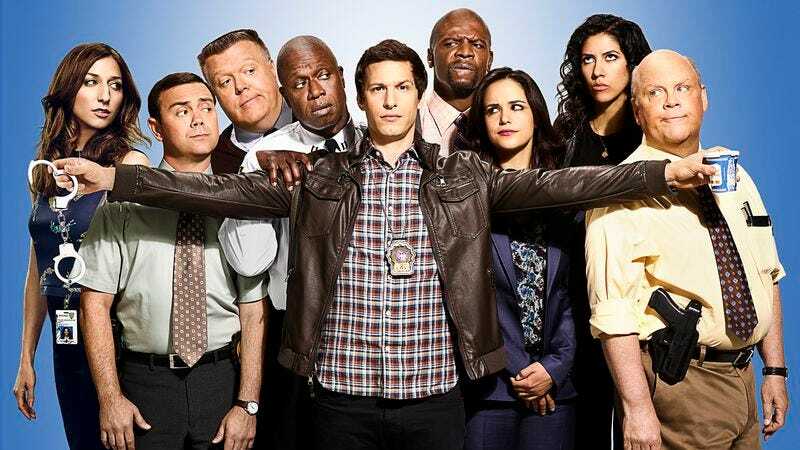 But as the conversation played out, more and more of the Brooklyn Nine-Nine cops chimed in, with Melissa Fumero, Terry Crews, and one cast member whose character is technically in hiding offering a look at what’s to come (and some of what’s not to come) when the show returns to Fox on Tuesday, September 20. Joe Lo Truglio: As we all know, Ken Marino is a consummate actor and writer, but for me—and this isn’t really funny—I can’t believe that I’ve known this guy since I was 17 years old and still able to continually do great work on great projects with him. So I’m really excited for Ken to be on the show. His character’s great. He plays this kind of people-pleaser kind of captain, Captain Stentley. And that’s right in Ken’s wheelhouse. He’s just able to do that so well. The guy’s kind of lax, doing his thing, he’s great. So that was a real trip for me. The A.V. Club: How has that relationship evolved over the years? Does it feel like it’s still the same dynamic that you guys had back at NYU? JL: In essence, it does. In terms of the kind of back and forth comedy sensibilities and the timing and our interests. What’s changed is we’re evolving as dads and husbands. That’s a different thing. But the back and forth, it’s the same as when we were 17. Which is why it’s so special, why I treasure it so much. AVC: You and Ken have worked together for so long. Last year’s premiere reunited Andy Samberg with Bill Hader. This year’s premiere also has Maya Rudolph, who worked with Andy on Saturday Night Live as well. How do people who haven’t worked with these guest stars before get into these pre-existing dynamics? JL: Well, I think the cast that don’t know Ken or didn’t know Bill were just so excited because their reputations preceded them. I’m speaking for them—I don’t think they were disappointed. I think what they found was the commonality between what Bill and Ken and me and Andy do is that everyone’s on an even playing field once you try to start doing funny material. What I think that people bring to it is the fact that everyone’s looking for teamwork. They’re not looking to be the funniest, but trying to do the funniest show. It’s interesting: The dynamic of Bill, Andy, me, and Ken, we’re very similar. Performers are coming from a place of ensemble comedy, and understand that it’s always better when you’re able to get everyone involved in it. This is a testament to [showrunner and co-creator] Dan Goor: Bring in the funniest writers and the funniest actors that have work that shows what they can do, and trust them to do what they can do. Because really on shows like Brooklyn Nine-Nine, or any good comedy, I think you’re trusting the actors that you hire to come in to be ready to play, to be ready to play around. Ken can play, and Bill can play, Maya can play. All these great guest stars that we’re having now understand that it’s important to be able to play. How many times did I say “play” right now? AVC: Maybe five or six? AVC: How does your character, Charles, feel about Ken’s character? Is he pleased by the people-pleaser? JL: In his head—and it’s good that Melissa’s here—he knows that a captain should be a little bit more of a disciplinarian and expect more from his detectives. And he can agree with that. But Charles is now becoming a father first, and caring about that more than being a detective. So Ken’s character is able to give him things that will let Boyle be a better father. So he’s torn. He knows that he shouldn’t like the captain, but he’s okay with the captain. Because he’s able to be a better father to Nicolaj, a 4-year-old from Latvia, who has almost given up smoking. AVC: So is he torn about that? JL: We’re talking about how Boyle feels about the new captain, and I was saying that Amy [Santiago, Fumero’s character] has brought him to a place where he knows that he shouldn’t want the captain in the precinct, but because he wants to be a good dad, and wants to get in shape, there are things this captain can give him. I’ll let Melissa talk about Amy. But I think you can get an idea. MF: Let’s just say, the new captain is a bit of a pushover. Not the sharpest tool in the shed, and yet still a figure of authority, and that’s a very difficult situation for Amy. AVC: Because she’s probably getting exactly what she wants from him, but is that what she wants? MF: No, it’s not. None of it is. So she’s in a bind. She’s probably got a lot of anxiety going on. JL: She misses her man. MF: She misses her man. Poor girl. AVC: With Holt and Jake in the Federal Witness Protection Program, she’s lost the two most important men in her life. MF: God, what are her nights like? JL: I can’t wait to meet Amy Santiago’s dad. JL: He had a recent brainstorm. I’m not going to name any names. I don’t want to mess it up. We discovered a person that was a big Brooklyn Nine-Nine fan that would be a great Santiago guy. MF: He’s an iconic Latin actor. MF: And we have told him multiple times. Basically, every time we’ve seen him. AVC: Okay, so just throw five names of Latin-American actors out there. MF: There’s only five. So go ahead, name five older Latin actors. AVC: John Leguizamo’s probably too young. MF: Maybe. Depends how we dress him. JL: He could be an uncle. AVC: Did we say Luis Guzmán? MF: Oh, Luis Guzmán could be one. JL: [Sarcastically.] I didn’t want to break this. But Lin-Manuel Miranda is playing Amy Santiago’s dad. AVC: He’s so hot right now. MF: He’s so prepared for it. He’s such a character actor. It’s going to be great. Even when I get down to thinking about Amy’s brothers, I’m like, “Oh, there’s six of them.” Try to come up with six Latin actors. Ugh, that’s a sad statement. But it’s going to be great. AVC: Is that how Stephen Root wound up playing Charles’ father? JL: Well, actually, no. No, actually, I don’t know how that worked out. Turns out, I didn’t know that he was my dad until after he was hired, and I flipped out. I’m a gigantic fan of Stephen Root. Who wouldn’t be? But yeah, a lot of the times we don’t know. JL: I read somewhere that Eric Roberts is on the show. Look, I’ll show you the article. Maybe it’s New Girl. Maybe he’s on New Girl. It was an article about the crossover, and they mentioned Eric Roberts. AVC: Maybe he’s part of the crossover. What do you know about those episodes at this point? JL: Not since the SUV and the standard vehicle has the crossover been better than what it’s going to be on Brooklyn Nine-Nine and New Girl. AVC: Do you have any fond memories of past sitcom crossovers? JL: Yeah, I liked when Mork went on Laverne & Shirley. MF: Oh, that’s a good one. JL: That was fun. But you know what was great about those, the Happy Days, Laverne & Shirley, Mork, you know who created all of those? AVC: The late, great Garry Marshall. JL: Correct. And so when you have a brilliant legendary creator like that creating all these shows that are different yet have that same kind of wonderful idealistic funny sentiment, all the characters fit. When you have two different shows, I’m not saying it’s impossible, it’s just a little trickier. There’s more than one person creating all the worlds. AVC: How do you think those sensibilities fit together? JL: Well, Liz Meriwether is super funny. MF: She is super funny. JL: So I have no doubt that both creators are wildly funny and talented, but I think it will be a challenge for them to bring it together. I’m sure they’ll do it. AVC: In your dream versions of the crossover, who do your characters interact with? Who are their immediate best friends? Because I’ve got some ideas. MF: What are your ideas? AVC: I think Amy gets along really well with Schmidt. I think they would be fantastic organizing buddies. MF: Yeah, I would enjoy an Amy-Schmidt neurotic scene. Like a quick one. Maybe it’s just quick pops of them out-neurosing each other. That could be fun. JL: I think Boyle would be taken aback and surprised by how much he wants Nick to be his best friend, and I think he would be torn, because Nick would be really cool. He’s kind of a fun guy. But so is Jake. MF: He’d feel like he’s cheating. JL: I think he’d treat it like a mistress. They’d have their own thing, but couldn’t tell Jake about it. I think that would be the thing. AVC: Sergeant Jeffords is so loyal to Captain Holt. This is another situation where a new captain is coming in. How does he feel about the new captain? Andy Samberg: Terry dies this year! It’s so crazy! AVC: I can’t believe you guys have been sitting on that this whole time. TC: A pile of weights falls on his head, dropped by Neil DeGrasse Tyson. JL: We wouldn’t have expected it either.